Happy Spring!! It is so exciting to be able to finally say that now! Here in Indiana, it has been a long, cold and snowy winter. The grass is starting to get a little greener, birds are chirping all around and it’s almost warm enough to start jogging again. I am a complete wuss and will only exert myself if it’s between 60 and 85 degrees outside. Anyhoo, I want to take a deeper dive into each pattern in the 2014 Spring Collection. How easy is it to sew? What are the options with the pattern? Fabric Recommendations? I want to address all of these with you. Let’s start from the beginning! This was my first inspiration for the line. My vision was a pleated skirt with a banded waistline. The band is meant to sit high on the waist. The skirt is fully lined helping add a bit of fullness. 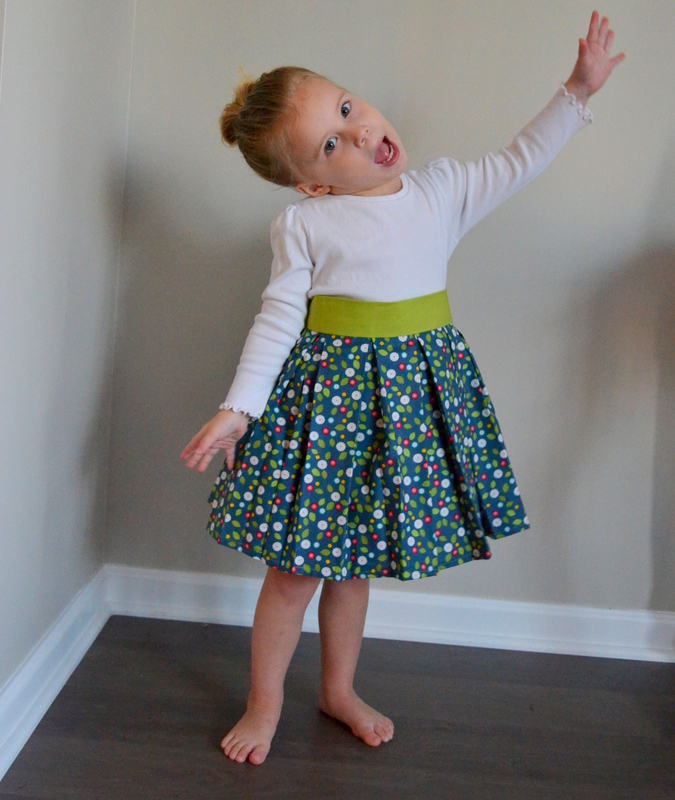 Does your daughter like to twirl in her pretty outfits? This is the skirt for her then! 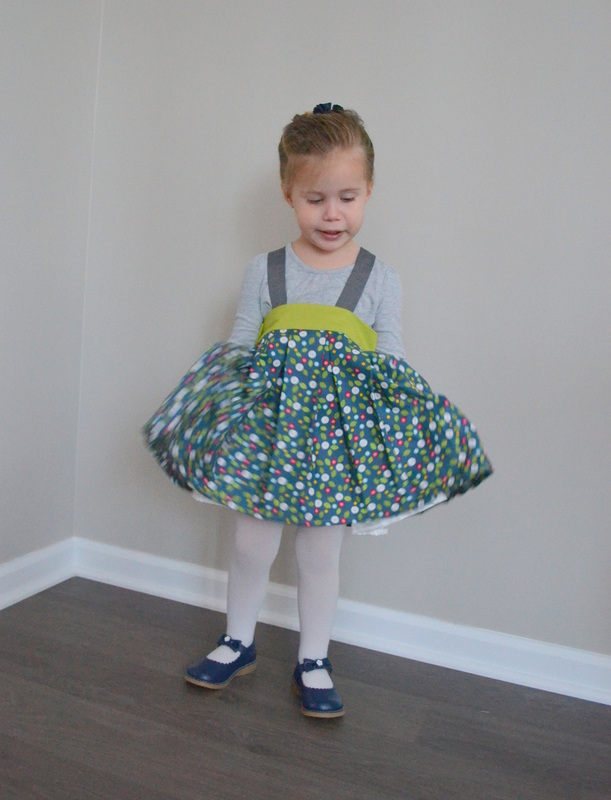 The skirt is also easy to get on and off with a hook and eye closure at one side. This also helps make the skirt waistline adjustable. 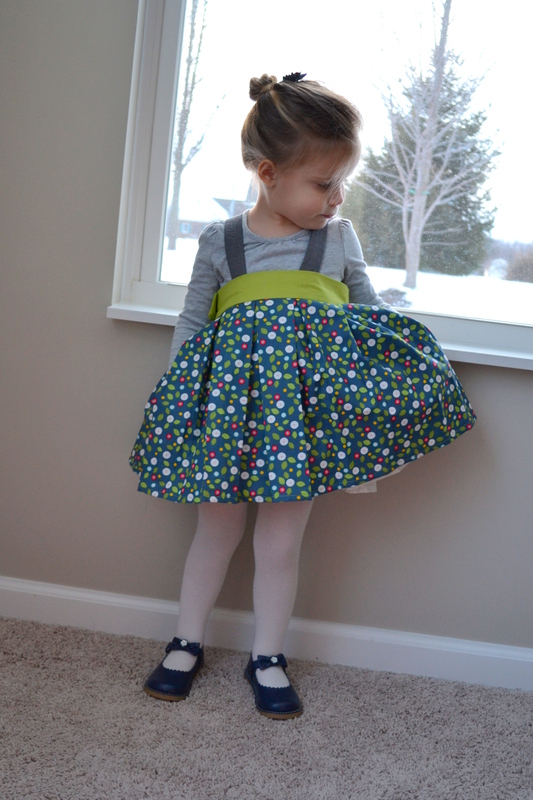 You could even add two eyes to help the skirt grow with your child. My absolute favorite feature are the pockets! 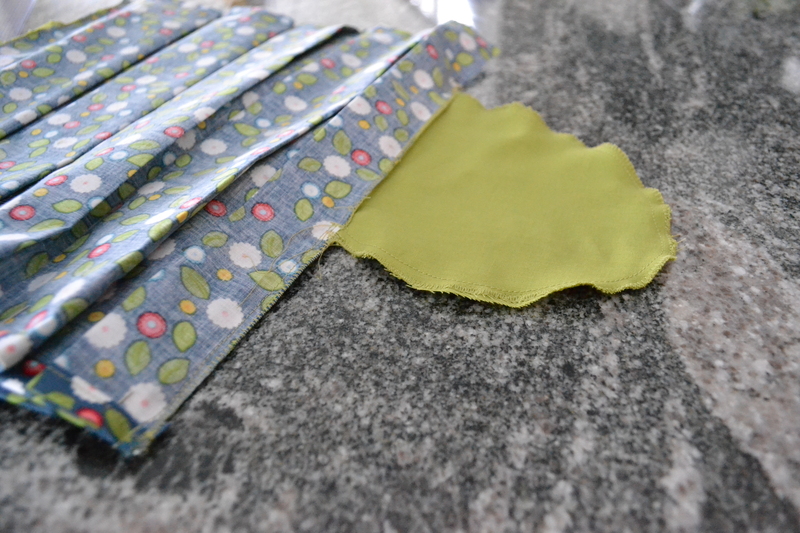 These are the easiest pockets you will ever sew and look super professional when complete. The straps are optional. Through testing, we found that the skirt is a bit hard to stay up high on the waist unless the straps are added. Crisscross the straps in the back for an added feature. By this point, I think Hannah was boycotting our photo session. 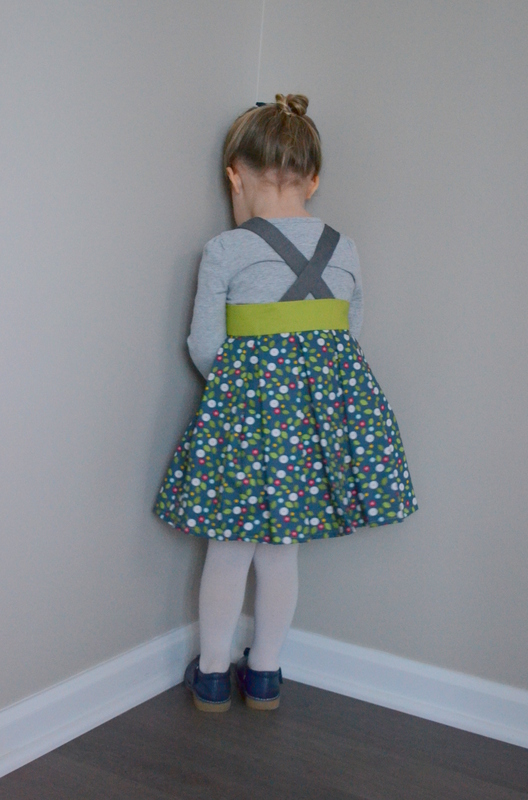 I promise I did not put her in the corner! 🙂 However, it is a great picture to show the backside. The straps are not sewn into the waistband. 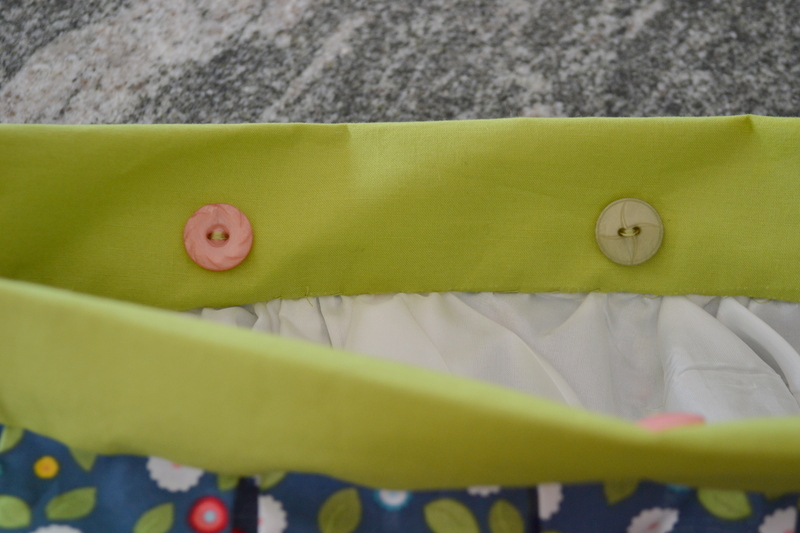 The skirt is designed with 4 buttons on the inside of the waistband. This allows the straps to be worn one day, and not the next. 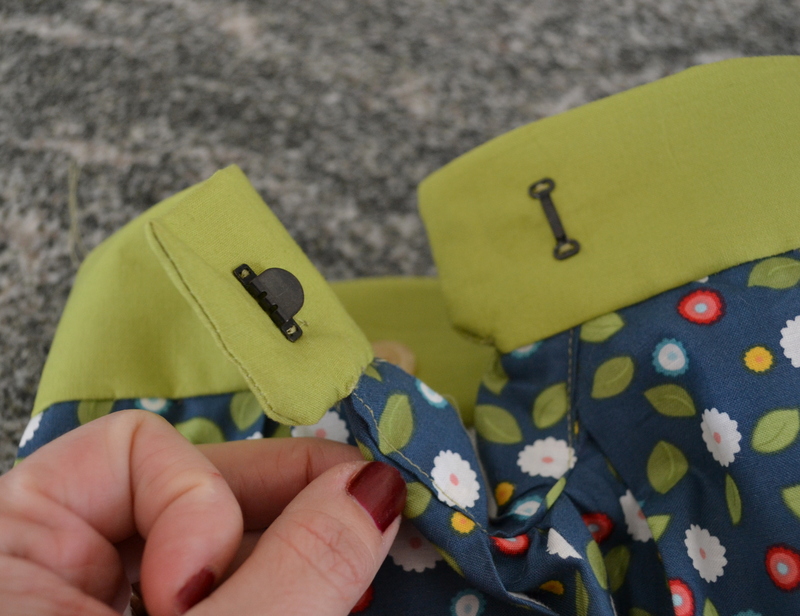 The straps have buttonholes on each end so they can be connected to the buttons. I also love the look of using suspenders instead of the straps. It’s a great way to give the outfit a bit more personality. I am seeing suspenders everywhere this year in children’s clothing wear. This is the perfect outfit to capture what we are seeing on the runway! Here is a picture from the photo shoot. We went for a dressier look and added the suspenders. 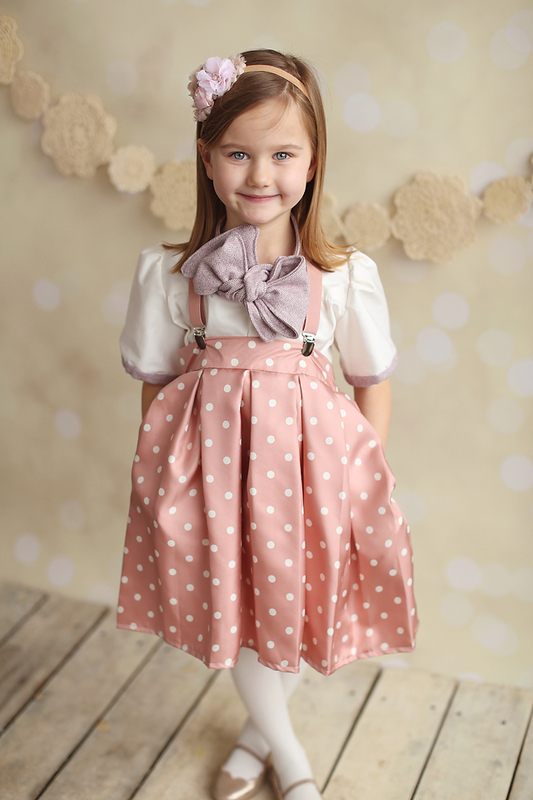 This pattern is geared towards advanced beginner/intermediate level seamstresses. I feel this trickiest aspect of this pattern is the pleats. It is important to iron and pin the pleats close to one another and even. Fortunately, we have taken out all the guess work in forming the pleats. We have a ruler that is printed along with the pattern for each size. No measuring is necessary with this pattern. Once you get past the pleats, you are golden. The pattern is really very simple from there on out. So what about fabric recommendations. 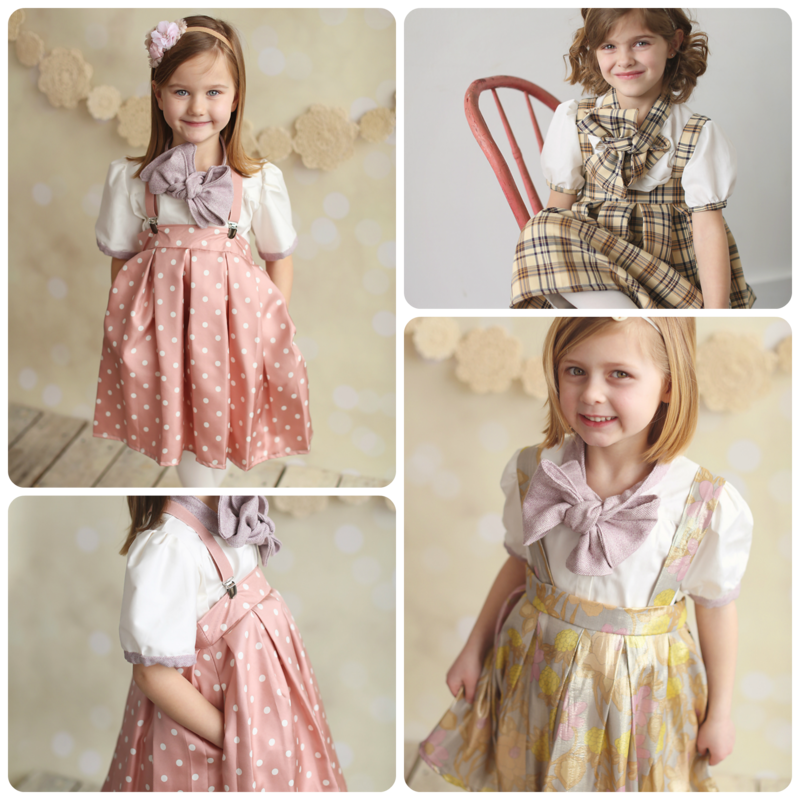 There is a wide array of fabrics that can be used in this pattern. Personally, I have experimented with cotton, silk, brocade and suiting material. 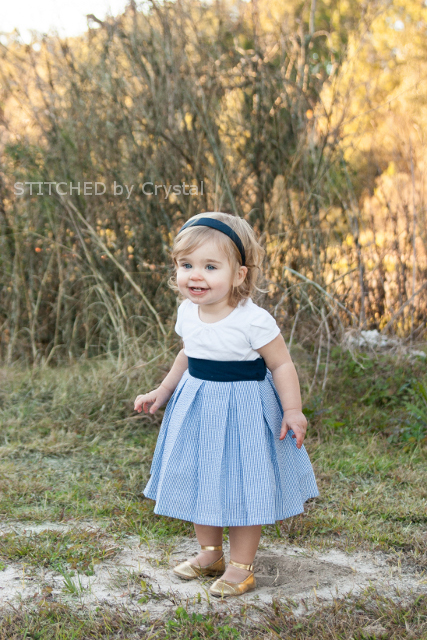 Check back for our next blog post on the rest of the 2014 Spring Collection! Next up will be the Maddalie Spring Dress.